Objective: To evaluate the performance of a near patient test for Helicobacter pylori infection in primary care. Design: Validation study performed within a randomised trial of four management strategies for dyspepsia. Setting: 43 general practices around Nottingham. Subjects: 394 patients aged 18-70 years presenting with recent onset dyspepsia. Main outcome measures: Results of the Flex Sure test compared with an enzyme linked immunosorbent assay (ELISA; HM-CAP) with an identical antigen profile and with results of an earlier validation study in secondary care Diagnostic yield of patients undergoing endoscopy on the basis of their Flex Sure result compared with those of patients referred directly for endoscopy. Results: When used in primary care Flex Sure test had a sensitivity and specificity of 67% (95% confidence interval 59% to 75%) and 98% (95% to 99%) compared with a sensitivity and specificity of 92% (87% to 97%) and 90% (83% to 97%) when used previously in secondary care. Of the H pylori test and refer group 14% (28/199) were found to have conditions for which H pylori eradication was appropriate compared with 23% (39/170) of the group referred directly for endoscopy. Conclusions: When used in primary care the sensitivity of the Flex Sure test was significantly poorer than in secondary care About a third of patients who would have benefited from H pylori eradication were not detected. Near patient tests need to be validated in primary care before they are incorporated into management policies for dyspepsia. Of the tests for H pylori that might be used in primary care, near patient tests have obvious attractions in being independent of a laboratory and giving a result quickly enough to guide initial management. Initial reports conflict as to the sensitivity and specificity of such tests,4–8 and there has been little assessment of their accuracy and performance in primary care. 9 10 As part of a trial of the management of dyspepsia in primary care we have used a near patient test in two of the four management strategies being compared. This paper reports our experience with one near patient test and compares the diagnostic yield resulting with that from early endoscopy. 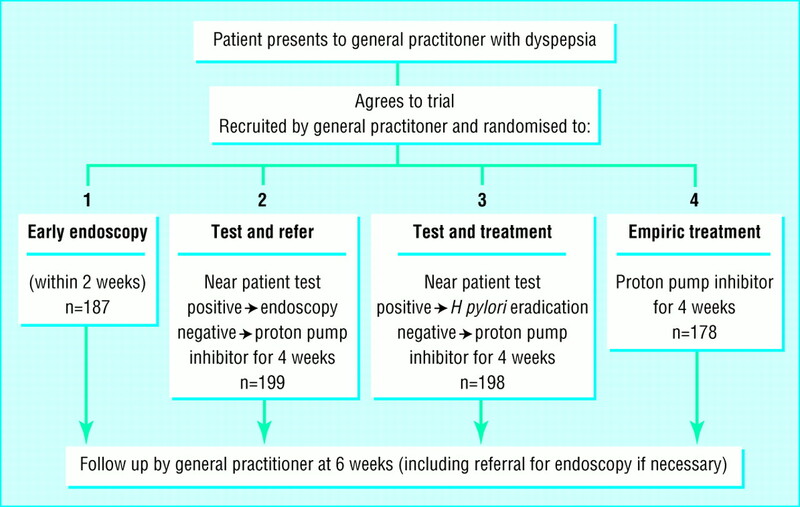 Between May 1995 and June 1998, 43 general practices in Nottinghamshire took part in a randomised trial of four strategies for the management of dyspepsia (fig 1). Two strategies involved testing for H pylori with the Flex Sure test (SmithKline Diagnostics, San Jose, California). In one, patients with positive results on the Flex Sure test were referred for endoscopy and in the other, patients with positive results received eradication treatment without further investigation. In the remaining two strategies, patients were not tested for H pylori but were randomised to early endoscopy or received empiric treatment with a proton pump inhibitor. After recruitment the completed near patient test card and blood sample were sent to University Hospital. The serum remaining was stored at −40° C and later tested with an immunoassay based H pylori test with identical antigen profile ((enzyme linked immunosorbent assay (ELISA); HM-CAP, Enteric Products, Westbury, NY, US). Testing was performed by a single operator blinded to the Flex Sure results. All general practitioners and practice nurses from the highest recruiting practices were sent a questionnaire with a five point Likert scale, asking about the test's ease of performance and interpretation of results. Results were analysed with SPSS (SPSS, Chicago, IL, US). Differences in the prevalence of disease between groups was assessed with a χ2 test. Antibody titres of patients with true positive and false negative Flex Sure test results were compared by using Mann-Whitney U test and the Wilcoxon rank sum test for non-parametric data. Linear regression and log linear regression were used to assess the relation between tests performed and the proportion of false negative results for each operator. The trial was approved by the University Hospital ethics committee and the local medical committee for Nottinghamshire. Between May 1995 and June 1998, 762 patients were recruited to the trial. The mean (range) age of patients was 42 (18-73) years. In 27% (204/762) of patients dyspepsia was of recent onset while in 28% (208) symptoms had first occurred five or more years earlier. In 422 (56%) symptoms of dyspepsia were reported to be of sufficient severity to interfere with the patient's normal daily activities. Flex Sure testing was performed on 394 patients in 39 general practices. Three patients refused testing. In the four remaining practices no patients were randomised to the two strategies involving H pylori testing. On the basis of the near patient test 98 (25%) patients were positive for H pylori, 291 (73%) were negative for H pylori, and for five patients (1%) the results were invalid (the control line failed to appear). Five patients did not have serum available for ELISA testing. Of the 389 remaining, 139 (36%) patients had positive results for H pylori by the ELISA test, 241 (62%) had negative results, and nine (2%) had indeterminate ELISA results, lying between the positive and negative cut off. The Flex Sure results relative to the ELISA results are shown in table 1. Flex Sure had a sensitivity of 67% (59% to 75%) and a specificity of 98% (95% to 99%) against ELISA. Eight of the nine indeterminate results on ELISA were negative on Flex Sure testing. The correlation between ELISA titre and Flex Sure result is shown in figure 2. 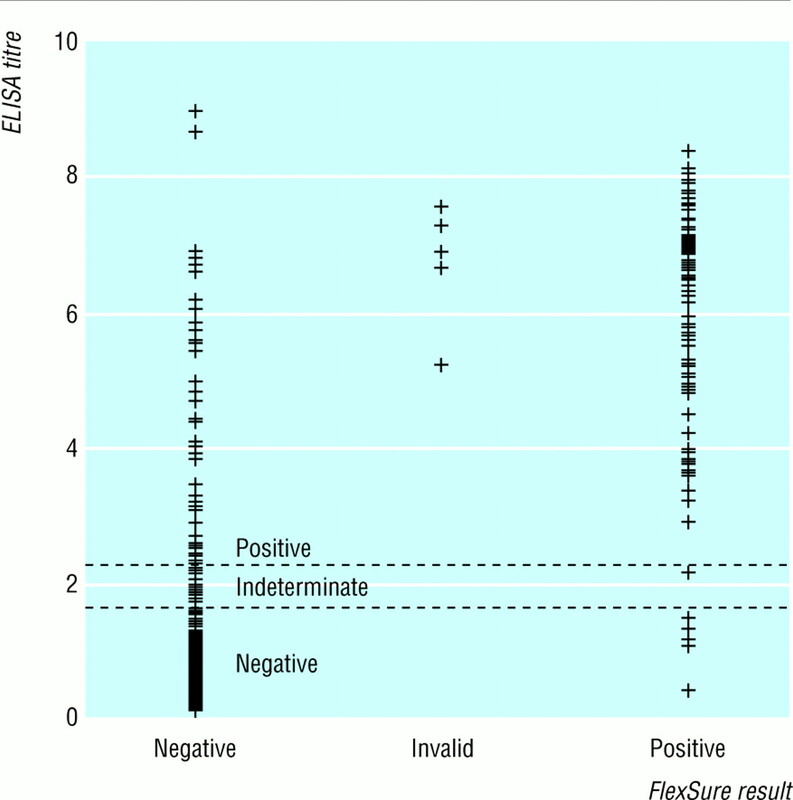 ELISA titres in the false negative Flex Sure group were significantly lower than in the true positive group (P<0.0001). Only one practice had a centrifuge. In all other practices blood specimens were allowed to stand before testing. The mean number of tests performed in each practice was 21 (range 1-43) with a mean of 8 (range 1-31) being performed by each operator. Practice nurses performed 74% (292) of tests and general practitioners 17% (66); in 10% (39) of cases the operator was unknown. The invalid results occurred in five different practices. The mean number of false negative results per individual operator was 0.8 (range 0-5), and the mean number of false negatives per practice was 1 (range 0-8). There was no correlation between the number of tests performed by an operator and the percentage of false negative results (P=0.8). Nineteen (79%) of the 24 general practitioners and practice nurses surveyed about the test replied. Eighteen (95%) respondents reported that the test was easy to perform and the results easy to interpret. Four (21%) respondents found it a problem to wait for serum to form, and only two (11%) believed the patients found it a problem to wait for results. Patients were usually contacted by phone with the result. Of the 394 patients who underwent the Flex Sure test, 199 had been randomised to the H pylori test and refer strategy. In this group 52 (26%) patients had a positive result on the Flex Sure test; 49 attended for endoscopy and three refused endoscopy. Endoscopic diagnoses in this group are shown in table 2 Eleven of the 12 patients with duodenal ulcers and the seven patients with erosive duodenitis were also positive for H pylori on urease testing (CLO test, Delta West Ply, Bentley, Australia). One patient had a malignant gastric ulcer. Of the 147 patients with a negative result on the Flex Sure test, 39 were later referred for endoscopy; one had erosive duodenitis and one had a gastic ulcer, both were positive for H pylori on urease testing. Thus of the 199 randomised to the test and refer strategy, 28 (14%) were found to have conditions for which H pylori eradication is indicated, although only 26 (13%) were detected as a result of positive results on Flex Sure testing. By comparison, 39 (23%) of 170 patients randomised to early endoscopy had conditions warranting eradication treatment—an absolute difference of 9% (1% to 17%). Near patient tests for H pylori have provided general practitioners with a quick and easy method of testing. Apart from two small studies, however, the performance of these tests has not been assessed in primary care. 9 10 We have found that the performance of one near patient test, which we had previously found to be satisfactory in secondary care was notably poorer with a much lower sensitivity when used in primary care. The explanation for this change is not entirely clear. None of the operators reported difficulty in interpreting the test results. No association was found between the total number of tests performed by an operator and the proportion of false negative results, although most operators performed fewer than 20 tests. We did find that the H pylori antibody titre in the group with false negative Flex Sure test results was significantly lower than in true positive group. This might indicate that antibody titres in our original series of patients in secondary care were higher overall than in primary care, with fewer patients with ELISA titres close to borderline. The impact of the lower sensitivity in our randomised trial seems to have been considerable as the diagnostic yield of ulcer disease in patients positive for H pylori in the test and refer group was only two thirds that of the immediate endoscopy group—a figure exactly in line with that expected from the reduced sensitivity of the test. We thank the Nottingham general practitioners and practice nurses whose considerable efforts in recruiting patients made the trial possible. Contributors: AED and RFAL designed the study and were responsible for data analysis and writing the paper. CE was responsible for data collection, processing, and analysis. RFAL is the guarantor. Funding The Nottingham Dyspepsia Management Trial has been funded by the NHS Primary/Secondary Interface R&D Programme, Trent Region R&D, Wyeth-Lederle, and Abbott Laboratories. The near patient tests and ELISAs were provided by SmithKline Diagnostics.
. Compendium of health statistics. 10th ed. London: Office of Health Economics, 1997.
. Dyspepsia management guidelines [abstract]. London: British Society of Gastroenterology, 1996.
. American Gastroenterological Association medical position statement: evaluation of dyspepsia. Gastroenterology 1998; 114: 579–581.
. The Helisal test: an assessment of readability and performance [abstract]. Gut 1996; 39: 110.
. Insufficient validity of a new rapid whole blood test for Helicobacter pylori (HP) infection [abstract]. Gastroenterology 1996; 110: 226.
. Validation of a rapid whole blood test for diagnosing Helicobacter pylori. BMJ 1997; 314: 119.
. Comparison of serum, salivary, and rapid whole blood diagnostic test for Helicobacter pylori and their validation against endoscopy tests. Gut 1997; 40: 454–458.
. Comparison of rapid office-based serology with formal laboratory-based ELISA testing for diagnosis of Helicobacter pylori gastritis. Dig Dis Sci 1998; 43: 103–108.
. An evaluation of near-patient testing for Helicobacter pylori in general practice. Aliment Pharmacol Ther 1997; 11: 01–05.
. An evaluation of whole blood testing for Helicobacter pylori in general practice. Aliment Pharmacol Ther 1998; 12: 641–645.
. Accuracy of near-patient blood tests for Helicobacter pylori. Lancet 1996; 348: 617.
. Breath test is better than near patient blood tests. BMJ 1998; 316: 1389.